Photorejuvenation is a therapeutic method utilized for the treatment of various skin conditions (acne, rosacea, scars, stretch marks, etc.) and for removing the signs of photo aging such as wrinkles, pigmented lesions, changes in skin texture. This therapy implies the use of either LASER or IPL light energy. 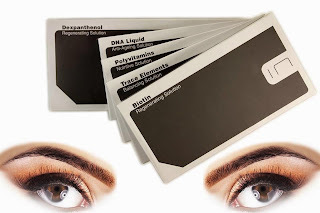 The principle is the following: in contact with the skin, light energy converts to thermal energy, which, to a certain extend, reverses the signs of photo aging by removing the appearance of the damaged skin. In addition, the process induces controlled trauma of the skin, determining self healing by creating new cells and by stimulating synthesis of new collagen fibers. IPL is a broadband, polychromatic light, with wave length generally between 500-1000 nm. LASER is a monochromatic light, with a unique wave length. Due to the rapid technological evolution, there is now the improved version of IPL - Square Pulsed Light SPL. The innovation is represented by the fact the energy level is constant throughout the duration of the light pulse, resulting in an increased efficiency. 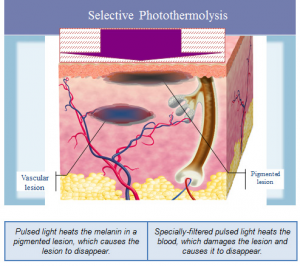 The process by which IPL treats the different target lesions is the selective photothermolysis - the light energy turns into thermal energy in contact with the skin; this thermal energy sterilizes the microbial outbreaks accumulated in the sebaceous glands - in acne; destroys the melanin in hair follicles or in pigmented lesions. It is also the thermal energy that determines blood clotting in dilated capillaries - in rosacea, telangiectasia, cherry angioma or other vascular lesions. 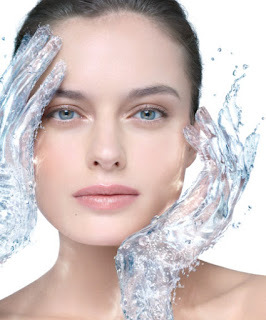 The main reaction induced by IPL is stimulating the synthesis of new collagen. The result is skin rejuvenation - a clear, smooth, tight skin with a homogeneous texture. The areas which can be treated with IPL are: face, neck, cleavage, upper back, hands; practically, all areas where skin is affected by photo aging. The treatment protocol should be personalized - the number of sessions and the intervals between them depend on the condition we want to treat, on the patient's age and skin type. My protocol - I generally commence with an intensive treatment, consisting of 4-6 sessions every 3 weeks, followed by maintenance sessions done every 6-8 weeks. Stanford University study, published in August 2012 in the Journal of Investigative Dermatology, reveals that broadband light therapy can change the genetic expression associated with the aging process to a young skin pattern. The study, led by dermatologist Dr. Anne Chang, strongly supports the hypothesis, that broadband light therapy is not simply a cosmetic procedure used to achieve a youthful appearance, but a method to provide a functional change of the genetic pattern of aging. "As an industry, to find a clinically sound solution for human anti aging is critical", said Dr. Macrene Alexiades-Armenakas from Yale University Scool of Medicine. "As a practicing physician in the field of dermatology, it is exciting to know there is a safe, light based treatment with groundbreaking clinical evidence supporting anti aging and the reversal of skin damage available to our patients". It has been demonstrated, that maintaining a steady annual rhythm of photo rejuvenation sessions with broadband light, we can reduce and delay the signs of aging, preserving a youthful, natural appearance. This is the beginning of anything you want. Page 1 of 365. HAPPY NEW YEAR 2018! The Eat - Stop - Eat method or Intermittent Fasting should be our lifestyle. It actually mimics the eating habits of our ancestors who did not have access to food at any time. Recent studies suggest that the human body was designed to function alternatively through periods with plenty of food and periods with no food. Without fasting, our health status is affected - this is demonstrated by the modern lifestyle, when too frequent eating triggers numerous chronic diseases and obesity which became endemic in the last decades. Eating continuously during a day, without skipping any meal determines the body to use carbohydrates as the main fuel and impairs the burning of the fat deposits for producing energy. On the other side - when not busy with processing the ingested food, our body is healing and repairing itself. Though very controversial, intermittent fasting is becoming highly popular these days due to its multiple benefits on health and longevity. A type of scheduled eating plan, consisting of the restriction of the normal daily eating to a limited window of hours without cutting calories. 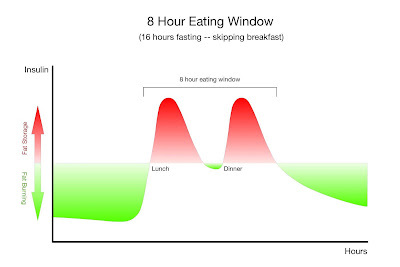 The 16/8 Method involves fasting every day for 14-16 hours, and restricting the daily “eating window” to 8-10 hours. Within the eating window, you can fit in 2, 3 or more meals. This method is also known as the Leangains Protocol, and was popularized by fitness expert Martin Berkhan. 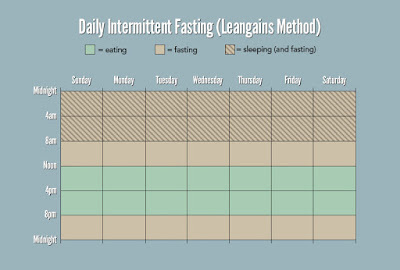 Doing this method of fasting can actually be as simple as not eating anything after dinner, and skipping breakfast. Water, coffee and other non-caloric beverages are recommended during the fast, this can help reduce hunger levels. For women shorter fasting intervals are recommended, 14-15 hours. It is very important to eat healthy food during your eating window. Eating junk food or an excessive amount of calories will compromise the benefits of the intermittent fasting. The 5:2 diet involves eating normally 5 days of the week, while restricting to 500-600 the amount of calories on 2 days of the week. This diet is also called the Fast diet, and was popularized by British doctor and journalist Michael Mosley. On the fasting days, it is recommended that women eat 500 calories, and men 600 calories. 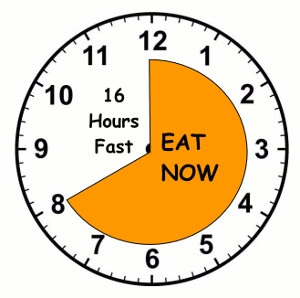 Eat-Stop-Eat involves a 24-hour fast, either once or twice per week. This method was popularized by fitness expert Brad Pilon, and has been quite popular for a few years. Water, coffee and other non-caloric beverages are allowed during the fast, but no solid food. A full 24-hour fast can be fairly difficult for many people. 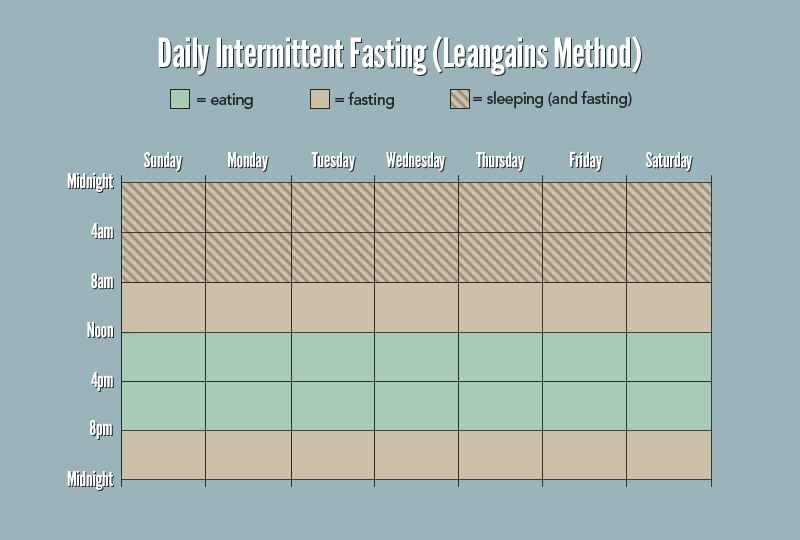 Alternate-Day fasting means fasting every other day. There are several different versions of this. Some of them allow about 500 calories during the fasting days. A full fast every other day seems rather extreme, so it is not recommended for beginners. The Warrior Diet was popularized by fitness expert Ori Hofmekler. It involves eating small amounts of raw fruits and vegetables during the day, then eating a big meal at night. Basically, you 'fast' all day and 'celebrate' at night within a 4 hour eating window. The Warrior Diet was one of the first popular diets to include a form of intermittent fasting. Another option is to simply skip meals from time to time, when you don’t feel hungry or are too busy to cook and eat. Skipping 1 or 2 meals when you feel so is basically a spontaneous intermittent fast. My favorite method is the 16/8 method; it is my lifestyle for more than 2 years now. I also work out first thing early in the morning, after the morning meditation and before eating anything. Coffee and water with lemon maintain satiety. My energy level is very high during the whole day. helps regulating Insulin sensitivity, important for our health; poor Insulin sensitivity causes type 2 diabetes. HGH - Human Growth Hormone levels may increase up to 5 fold during fasting periods; high levels of HGH favor fat burning and muscle gain. by improving blood pressure and reducing blood levels of sugar, triglycerides, cholesteroland inflammatory markers, intermittent fasting significantly lowers the risk for developing heart diseases. studies done on animals indicate that fasting may help in preventing cancer through the numerous beneficial effects on the metabolism; human studies showed that it can decrease the side reactions of chemotherapy. several studies in rats have shown that intermittent fasting may increase the growth of new neurons, which should have benefits for the brain function; it also protects the brain from damage. last and most exciting - intermittent fasting could extend the lifespan; in one of the studies, rats that fasted every other day lived 83% longer than rats who did not fast. Very promissing! These are the effects of the intermittent fasting proven by animal studies. But what about us, humans? Is the human body programmed for a low meal frequency? Only a few experimental studies have been coducted on human subjects, they led to controversial reactions. A very interesting aspect is the association of intermittent fasting with exercise. It has been shown that working out when in a fasted state, 'on an empty stomach', has multiple beneficial effects on health and fitness. Dr. Mercola suggests that it could be the key "to keep the body biologically young". The easiest way to do this is exercising first thing in the morning, before eating breakfast. The combination of fasting and physical exercise increases the impact of cellular factors and catalysts, forcing the breakdown of fat and glycogen for energy. Gender is another important factor in human and animal studies. Female-specific responses to fasting raise an interesting scientific phenomenon. Researchers have been finding evidence that there is indeed a compromise between fertility and longevity of organisms. The same genes that promote human longevity may trigger biological mechanisms that suppress female reproductive capacity. If you decide to try this out, keep in mind: Calories count and food quality is crucial! We are all familiar with what "Aging" means, aren't we? But when it comes to defining "Aging", it is not that simple. According to Medicine.net aging is "the process of becoming older, the process being genetically determined and environmentally modulated". Until recently, aging has been considered an inherent, progressive degradation of the human body. But in this era of hectic informational and technological development, the new medical discoveries determine a total different approach and a radical change in the way people view health and well being as they grow old. Most of the natural aging mechanisms determine the development of diseases. Logically, fighting the process of aging would prevent disease and improve health despite getting older. This is basically the principle of Anti Aging Medicine. It is a holistic discipline, not yet accredited by most Medical Associations all over the world; the goal is to extend human lifespan with maximum health level. The nomenclature can vary from Biogerontology, Age Management Medicine to Advanced Preventive Medicine - it is the same medical branch, which treats the individual as a whole and aims to eliminate any age related ailment. Today's tendency in Anti Aging Medicine is Prevention, rather than cure. Balanced diet - considering a correct Insulin/Glucagon activity and a proper protein - carbohydrates - fat ratio. Eating properly builds the foundation for a high quality of life and increased longevity. Exercise - considered to be the secret of longevity. Exercise has been described as 'an anti aging pill'. Yoga and meditation for maintaining and improving mental health. Many of the aging mechanisms are still unknown. The future of anti aging medicine will probably involve genetic engineering, the use of stem cells for cellular and tissue renewal and nanotechnology for targeted drug and nutrient delivery. "First thing every morning, I massage organic sesame oil from the health-food store all over my body. Working it in wakes me up and really gets my blood circulating. Plus, the oil hydrates my skin, giving it a healthy glow. Then I jump in the shower—the oil naturally cleans away dead skin cells. "—Lisa Hedley, founder and creative director of the Mayflower Inn and Spa, Washington, Conn.
"Anti-inflammatories are the best anti-agers out there. From improving heart and immune functions to helping hair grow and skin look supple, they truly do wonders. I take three 500 milligram capsules of omega-3 fish oil in the morning and at night. I look for labels that say, 'molecularly distilled for purity,' which means pesticide-free. "—Arlene Noodleman, MD, medical director of the Age Defy Dermatology and Wellness Center, Campbell, Calif.
"I absolutely believe in massage. Moving blocked energy makes me feel younger from the inside out. I especially love reflexology and deep-tissue massage. "I use an over-the-counter topical vitamin C cream that has a 30% concentration. It's a wonderful antioxidant that helps my skin repair itself from sun damage. Plus, it has natural sunscreen properties in it, so combining it with my daily SPF has a synergistic effect. "—Arlene Noodleman, MD, medical director of the Age Defy Dermatology and Wellness Center, Campbell, Calif. 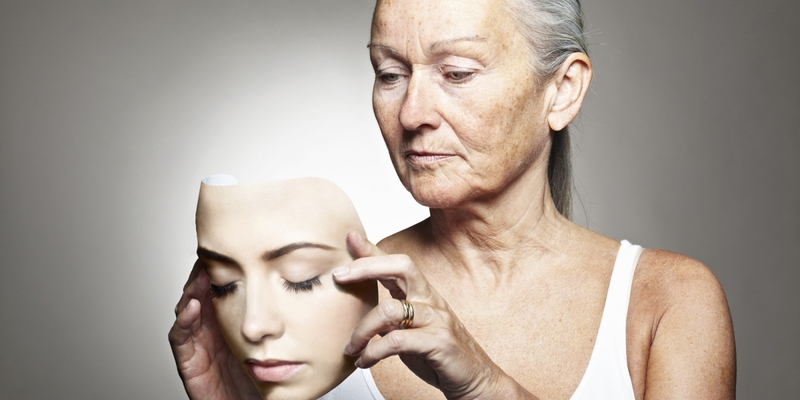 Aging is a complex biological process influenced by both endogenous and exogenous factors. Due to the fact that skin health and beauty is considered to be one of the main factors representing overall “well-being”, research is focusing these days on anti-aging strategies, on delaying the signs of aging as much as possible. 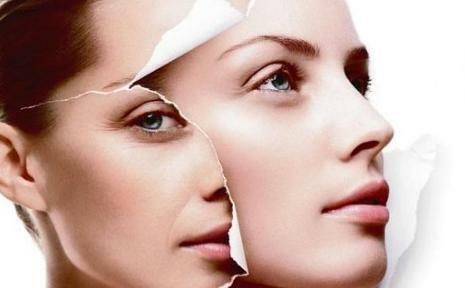 Skin aging is part of the natural human aging process, which becomes evident in the different organs, tissues and cells as years go by. While the aging signs of internal organs are 'invisible', the skin provides first obvious marks of the passing time. Aging is an inherent process, not a pathological condition. 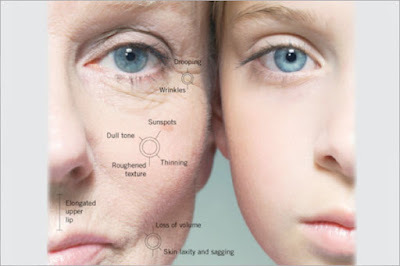 But despite this fact, regarding the entire face, aging is associated with multiple changes in shape and texture - sagging skin, loss of volume, redistribution of fat tissue, loss of bone structure,etc. "Healthy, successful aging" - this is today's tendency, meaning minimizing the signs of aging of the human body and - most important! - preventing the installation of age related disorders and delaying the aging process. This is also the main direction of Preventive Aesthetic Dermatology, using different therapy methods - local or systemic, non invasive, instrumental or invasive. The age, previous procedures, general health status, skin type, lifestyle and many other factors should be considered before choosing the therapeutic strategy for a certain individual. The desired therapeutic anti-aging effect of the skin is a continuous, step-by step process, which combines various methods of skin bio-revitalization and rejuvenation, restoration and augmentation of each skin layer, resculpturing of face contour. One of my preferred anti aging treatment methods is Mesotherapy. the results are very natural looking and even (uniform). generally offers long lasting results. Simple science: peptides are fragments of proteins; peptides themselves are made up of amino acids. The combination of amino acids in a certain sequence leads to creation of specific peptides - and there are hundreds of peptides. And when peptides are linked in a certain way, they build specific proteins. Proteins are the basic building blocks of the skin. Scientific studies have revealed that peptides are 'intelligent molecules' that enhance the informational flow necessary to repair damaged skin. They rebuild the damaged protein blocks of the skin. Their main function is intercellular communication, meaning that they are acting as messengers in the different layers of the skin to transmit information between the cells, and so altering the way these cells function. With age, the signals communicating instructions to the cells to repair themselves and produce collagen and elastine, which is what keeps the skin smooth, firm and young, are switched off. The main task of the peptides is to communicate new instructions to the cells to restart these activities. In time, natural peptides lose their capacity and this is the reason our skin looks older, wrinkles, blemishes, age spots, loss of tonus appear. The BCN Advanced Cocktails-Peptides line is a range of products whose main components are the new generation peptides which act in synergy with other advanced active ingredients, such as collagen, hyaluronic acid, vitamins etc., to achieve spectacular results for the skin and hair. The peptides act directly in the cell through specific receptors on the cell membrane, modulating, controlling and regulating their biochemical functions. BCN Lumen-Peptides is a sterile solution based on a combination of 3 types of active principles for the treatment of hormonal cause pigmentations, due to the aging process and/or post inflammatory hyperpigmentations. It acts at different levels of the metabolic process of the melanin synthesis in the skin, decreases melanogenic factors, inhibits melanogenesis, increases the cellular detoxification and reduces the melanosome transfer to the keratinocyte. Thanks to the unique new generation peptides, it intervenes at a subcellular level by modulating the transcription of several melanogenesis key elements. It also regulates the intra and intercellular communication and ensures cell survival. 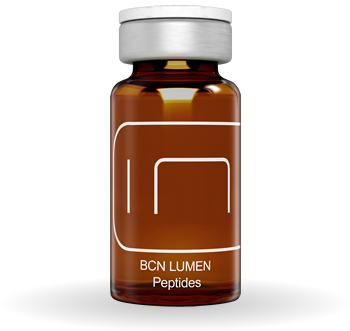 BCN Lumen-Peptides has in its composition other ingredients such as hyaluronic acid, vitamins, minerals etc. providing a complete anti aging treatment for a bright, moisturized skin with a luminous, uniform tone. The formulation of this advanced combination of active principles strengthens and tightens the skin of the face and body. The new generation of peptides act synergically with the different classic active ingredients on all elements of the extracellular matrix (ECM), their synthesis and degradation, contractility, cell adhesion, at the level of the dermis - epidermis union and muscle tone. The hyaluronic acid, vitamins, minerals, amino acids and the rest of the components of the formula, take care of the skin health as a whole thanks to their revitalizing actions and other anti-ageing properties. BCN Tensis - Peptides fights sagging skin and loss of elasticity, restoring the tonus, at the same time. It is a sterile solution based on a combination of three groups of active ingredients for the treatment of hormonal type alopecia (androgenetic) or caused by other internal or external factors such as nutritional deficiencies and/or stress. It is a rejuvenating hair treatment and excellent adjuvant of other medical aesthetic solutions for this indication. Its exclusive composition includes new generation peptides that through cell engineering, emit biomodulating protein signals to regulate the elements expression involved in the whole cycle of hair growth. These peptides, in synergy with other specific active principles, regenerate and reinforce the extracellular matrix (ECM) and the dermal papilla, influence the dihydrotestosterone synthesis, increase microcirculation, nutrition and oxygenation, lengthen the anagen phase and avoiding the follicle involution. BCN Capillum-Peptides formula is completed with vitamins, minerals, amino acids and hyaluronic acid, among others for a complete scalp care as, which improve hair appearance and provide a more voluminous and healthier hair. In the past BOTOX, now - a cocktail of active ingredients, consisting of vitamins, trace elements, amino acids, hyaluronic acid. Did you hear about treating wrinkles, cellulite or hair loss with mesotherapy? If not, let's discover the secret. Tell us more about yourself and your passions. How does a day in your life look like? "My history" begins in Bucharest, Romania - the German School and the Faculty of Medicine have built a solid foundation for the years to come. I lived in Israel for a long period of time; it was in Israel where I actually started my professional activity and my specialization in Aesthetic Medicine. As in all areas, in Aesthetic Medicine you have to be permanently up to date with new treatment methods, with new products and technologies, so that I have been continuously studying and participating at workshops,international congresses and conferences for Aesthetic and Anti aging Medicine. I have many passions - music, theater, movies, swimming, cooking - I love cooking, always experimenting new recipes. But my great passion is my profession. My day starts at dawn - even so, 24 hours are usually not enough; one, two hours for me only - meditation, workout and yoga, afterwards coffee, a healthy breakfast and planning the day that awaits me. Following is the work at the clinic, sometimes until late. My days are never alike. The evenings are dedicated to my family. When did your connection to beauty start? 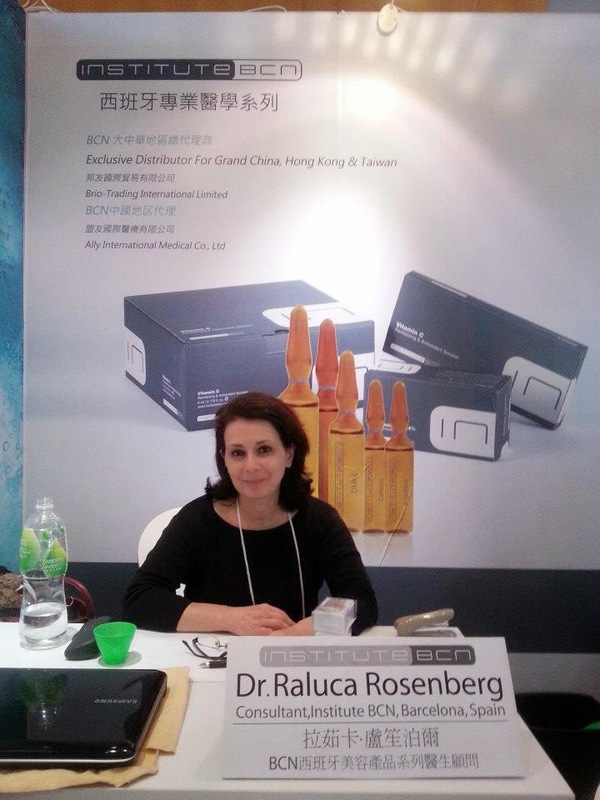 My activity in Aesthetics started almost 15 years ago in a big Institute for Aesthetic Treatments in Israel. In the following years I had the opportunity to complete my specialization in France and Spain, countries which brought a significant contribution to the development of Aesthetic Medicine. To make people happy, to make them smile when they look in the mirror, to help them regain their confidence and optimism. Having the power to make a difference in peoples' lives is a huge privilege! But you are eternity and your are the mirror. Awareness of people for personal care - how important is it? Very important - and not only from the aesthetic point of view. Personal care means balanced nutrition, correct hydration, physical activity, yoga, meditation, etc. By being aware of all these factors we will be able to live a long , healthy and beautiful life and postpone aging of body and mind. Could education help in increasing the awareness for personal care? making people understand that prevention maintains a healthy and youthful life and that it is much easier to prevent than to treat. updating people with latest methods for personal care and treatments, new products and technologies. Every patient who enters the clinic sad and depressed and leaves with a bright face, smiling - makes me happy! And this happens every day, many times a day! Who are the people that inspire you? I truly admire all people involved in creating beauty - famous painters and sculptures, big composers, movie producers , fashion designers. But people who inspire me are the ordinary people which I meet everyday. How would you define authenticity? In my opinion, authentic is unique and simple. 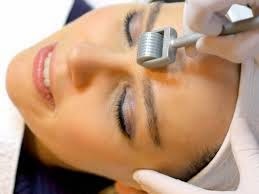 Collagen Induction Therapy (CIT) also known as Medical Micro Needling is an innovative minimally invasive procedure utilized in aesthetic medicine for skin repair and rejuvenation and for hair restoration. Though known for almost 2 decades, medical micro needling became exceedingly popular in the last few years due to the amazing results, the long term effects and the cost effectiveness. The modern time history of Collagen Induction Therapy begins in the 1990's. But it actually has its origins in ancient China as acupuncture used in the traditional Chinese medicine as a natural remedy for most diseases and abnormalities. Also Korean and Japanese have been using this method since antiquity, with some variations. In China stainless steel needles of different lengths were used for acupuncture, Korean used needles made of copper; the instruments of the Japanese healers were very thin needles guided by a a tube. In that far era, skin needling was an exclusive therapy, for wealthy and powerful only. The German dermatologist Dr. Ernst Kromayer is the inventor of the multiple needle electrolysis. He published in 1905 his work and studies - he treated scars, birthmarks and pigmentation abnormalities of the skin, aiming to reduce scarring and to improve the appearance and the texture of the skin. During the 1950's, Kromayer's work was 'reinvented' by Dr.Abner Kurtin, an American dermatologist. He modified the technique, using stainless wire brushes instead of the dental burrs, originally used by Kromayer. Among the pioneers of anti aging medicine Alexis Carrel, French scientist and Nobel Prize winner for Medicine is one of the most prodigious; 2 of his followers described a new technique for the treatment of scars and wrinkles using a hypodermic needle. In 1997, the Canadian aesthetic surgeon Dr. Andre Camirand published his study, in which he described his successful results in performing skin needling with a high-speed tattoo gun. Together with his associate, he found out that the reduction in scar tissue is caused by the needles of the tattoo gun and not by the pigment. Dr. Des Fernandes, the Cape Town based plastic surgeon said at an interview in Kuala Lumpur in 2011 "Skin needling is very controversial because it sounds wrong. What we've discovered is that when you prick your skin, it doesn't leave a scar. When you injure skin tissue, the platelets release growth factors for the skin to heal. It promotes more collagen and elastin. We found that TGFB3 (Transforming growth factor beta-3) molecule helps tissue to regenerate instead of scar," he said. He developed his own needle stamp using it in his practice for skin needling of the upper lip with excellent results. This was the first step towards the development of the modern Dermaroller and the automated pen-shaped devices. Personally, I prefer the manual option because it allows full control during the procedure and a more uniform effect on the entire treated surface. The treatment consists of introducing a series of fine, sharp needles into the skin. The needles are attached either to a single use, sterile roller - which is rolled over the treated skin area to create numerous microscopic channels - or to a single use needle cartridge at the end of a Derma Pen. The micro traumas stimulate the body to synthesize new collagen and elastin. As a result of this repair process, the skin becomes thicker, brighter, plumper with a more youthful appearance. Both men and women can benefit from Collagen Induction Therapy. The most important aspect , in my opinion, is the fact that Collagen Induction Therapy can be applied to individuals with any skin type - Fitzpatrick I- VI, compared to Photo Rejuvenation (LASER, IPL) procedures restricted by the skin type. Skin preparation consists of cleansing and disinfection of the treated area and application of a topical anesthetic for approximately 20 minutes. However, sensitive persons might still feel discomfort during the procedure. Depending on the area of face or body being treated and the type of device used, (i.e. needle length) the procedure is usually well tolerated and in some cases virtually painless. The duration of a treatment session depends on the treated area and varies between 10 min and 1 hour, including the application of a personalized cocktail according to the problem we treat, to the gender and age of the patient, to the treated body area. The protocols also depend on the problem we treat. If necessary, the 10 sessions series can be followed by 2-4 maintenance sessions. Generally, there are no patterns; every patient reacts differently. When using the medical micro needling therapy for anti aging treatments, I always prefer to invite my patients for a follow up 7-10 days after the first session, in order to assess the effects and to establish how to continue the treatment. After the medical microneedling treatment, the skin will be pink - red for a 2-3 hours, similar to a sunburn; minor bleeding and bruising is possible, depending on the treated area, length of the needles,etc. The skin may feel warm and itchy. All these effects resolve in 24-48 hours in most of the cases. Practically, the patient can return to his activity immediately after the procedure. Highly recommended that Medical Micro Needling with medical grade rollers or automatic devices should only be performed by qualified doctors, surgeons or nurses. apply a broad spectrum sunscreen product with a high SPF immediately after treatment before leaving the clinic and when going outside following treatment - very important! The first signs can be observed immediately after the treatment session, the effects enhance during the following 4-8 weeks due to the synthesis of new collagen and elastin and to the repairing process of the skin. The advantages of the collagen induction therapy: cost effective, quick, with virtually no risk or side effects, with minimal discomfort and with amazing long lasting results! Body reshaping can be often challenging for many 40+ old women. Dr. Raluca Rosenberg, aesthetic doctor, claims she found the 'magical formula': balanced eating, correct hydration and physical exercise. And, for a fast remodeling of the silhouette, she recommends the conventional mesotherapy. Find out in the following interview what this treatment implies and how efficient it is. Which are the most efficient treatment options for women aged 40+? Modern aesthetics offers a vast range of treatment options, that is why choosing the most suitable and most efficient method can be often difficult. It is mandatory, before making a decision, to do a detailed research. Generally, it is important to know how to take care of our body, how to maintain our health status and our appearance, not only after age 40. A correct lifestyle, a balanced diet, physical activity will prevent many problems, regardless the age. As for me, when I decided to dedicate myself to Aesthetics, mesotherapy drew my attention, not only due to its proven efficacy, but also because it is a simple, natural, logical and relatively quick method. For body treatments, I recommend conventional mesotherapy, which enables the penetration of the active ingredients into the deeper layers of the skin, with excellent results in a short period of time. What are the benefits, but also the risks of these treatments? Worldwide, conventional mesotherapy is utilized both in medicine and in cosmetics, providing solutions for treating a broad range of issues. Referring strictly to the theme of this interview, mesotherapy is probably the most reliable method to eradicate cellulite and localized fat deposits, specifically those resistant to diet and exercise. It has virtually no side effects and it does not require post treatment recovery. 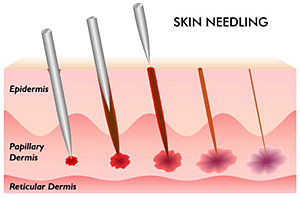 Depending on the treated area and on the purpose of the treatment, a mixture of 3-4 active ingredients is injected into the deep layers of the skin, using specific injection techniques and special needles between 4-12 mm (Nappage, Point per Point, intradermal papules). Certainly, when we decide to start this sort of treatment, we are willing to make a change, that is why we need a multiple action plan: first, proper eating habits and, if necessary, an appropriate diet for each case; and second - a workout plan, individualized for each and every person. There are often cases when body weight and physical condition are not an issue; however, cellulite and resistant fat deposits are present. With conventional mesotherapy we can solve these problems in a relatively short time and with excellent results. The ingredients used in mesotherapy are either substances we have in our body (Hyaluronic Acid, X-DNA, vitamins, trace elements,etc.) or are plant extracts (Artichoke Extract, Rutin&Melilot Extract, etc. ); that is why there are only few contraindications. Pregnancy and breast feeding, systemic diseases, immunosuppressive diseases are the major contraindications of mesotherapy. Very important to note, that mesotherapy is not a slimming method, that means that obesity cannot be treated with this method. How many sessions are necessary in order to obtain visible results? Both in conventional and in no needle mesotherapy, there is a treatment protocol to be followed in order to achieve the desired results. The number of the sessions depends on the age of the patient, his reaction to the treatment, the severity of the problem, etc. The mesotherapy sessions should be done weekly, the effect is cumulative. For minor cases, 4 sessions are usually sufficient. For more severe cases, the number of sessions varies between 6-8-12; it is also important to follow the doctor's recommendations regarding diet and workout. What are the most spectacular results you had in your practice? For me, every woman who enters my practice with cellulite and leaves without represents a spectacular result. How efficient are these treatments without diet or physical activity? Following the treatment with mesotherapy, cellulite or fat deposits disappear and no maintenance sessions are necessary. The conditions for maintaining long term results are: balanced diet, proper hydration and exercise. What is your advice for the ladies who want to lose weight and reshape their silhouette? The 'magical formula' is balanced nutrition, correct hydration and sustained physical activity. These 3 elements are sufficient to keep us in shape, regardless our age. And if shaping certain areas is needed, conventional mesotherapy is, in my opinion, the fastest, most reliable and most efficient method. Are you searching for a therapeutic option to stop hair loss or to improve the texture of thinning hair? MESOTHERAPY is the solution; and it can change lives! Hair loss is a stressful and challenging experience for both men and women; it is significantly more distressing for women, especially in this era when capillar hair symbolizes youth and good health. Hair loss can have important psychological and social impact, caused by the strong influence on confidence and self esteem. The most common form of hair loss is androgenetic alopecia, affecting approximately 50% of the masculine population and 20% of the women, by age 50. Comparing to all the other types of alopecia, the onset of the androgenetic alopecia is gradual and has a specific pattern. In men - there is a gradual thinning of the hair in the temporal areas, forming a V-shaped frontal hairline; as baldness progresses, a bald patch appears on the crown of the head, the hair around the base of the head usually remains intact. Women with androgenetic alopecia have diffuse thinning hair on the crown of the hair. This form of alopecia is genetically transmitted - the exact mechanism is still unknown. Aging and genetics are only 2 of the factors causing hair loss. Stress, psychological trauma, systemic diseases, improper eating, hormonal imbalance (thyroid disorders), certain drugs (steroids, Lithium, Heparin, beta-blockers), Zinc deficiency, pregnancy can also cause hair loss. There are numerous treatment options: drugs (Minoxidil, Finasterides - can be administered to men only), topic solutions or more complex treatments like hair transplantation. Although controversial worldwide, mesotherapy has proven its efficiency in treating hair loss. The success rates reach 90-92% in comparison to Minoxidil treatments ( only 50% success rate). Mesotherapy is a minimal invasive method, safe and with no side effects. A cocktail composed of 3-4 active ingredients is injected directly into the scalp, using a special injection technique (Nappage). Biotin, Trace Elements, vitamins, Caffeine, Gingko Biloba, Organic Silica, Dexpanthenol, peptides are some of the ingredients utilized in treating hair loss with mesotherapy. How does mesotherapy work in hair loss treatment? - at the same time, the multiple injections create micro channels, through which the cocktail reaches the hair follicles, in the dermal layer of the scalp. The active ingredients improve the blood circulation (Gingko Biloba, Rutin&Melilot Extract), stimulate cellular metabolism (Asian Centella), balance sebum secretion (Dexpanthenol), increase cellular regeneration (X-DNA). My treatment protocol consists of 8-10 weekly sessions, followed by 2-4 sessions, fortnightly and 2-4 monthly sessions. There are situations that require maintenance sessions. In most cases the first results appear in the early stages of the treatment - the hair doesn't fall anymore and it regains the natural glow and vitality. New hair starts growing about 5-6 weeks from the first session. Mesotherapy is beneficial for both men and women. For male patients, we can also use the alternative to the conventional mesotherapy - Derma Roller or Derma Pen, the principle is the same. Mesotherapy is virtually painless - the discomfort during the treatment is minimal, no previous anesthesia is necessary. It is important to mention that this exact therapeutic method can be applied for the treatment of Seborrheic Dermatitis, often associated with alopecia. Eyebrows can also be treated with mesotherapy, with amazing results. In our era, the percentage of women affected by cellulite is worryingly increasing towards 90%. time and money spent for various therapy options, searching for the 'miracle' treatment. Fortunately, nowadays the magical method that eliminates cellulite really exists - it is called mesotherapy. Why is mesotherapy considered to be the only method to eradicate cellulite? Because it treats the causing factors of cellulite, not only the symptoms: mesotherapy determines the breakdown of the fats in the fat tissue, activates the microcirculation and stimulates cellular metabolism, improves lymphatic drainage, increases skin tone and elasticity. Mostly, cellulite affects 25-35 years old women. Untreated, cellulite intensifies. In the early stages of cellulite, mesotherapy works very quickly - 4 weekly sessions are usually sufficient to eliminate the cellulite. Any type of cellulite can be treated, the variable is the number of sessions needed to eradicate the cellulite (12-15 sessions for cellulite stage 3). Mesotherapy is a fast and safe method. 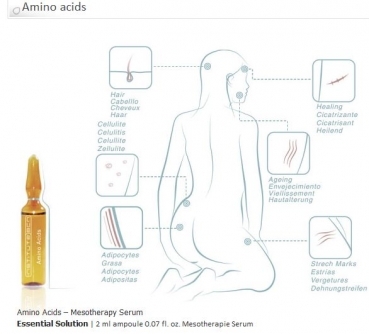 It consists of injecting a mixture (cocktail) of 3-4 active ingredients chosen according to the age of the patient, to the stage of the cellulite, to the affected body area. Arms, thighs and buttocks are the most affected areas. The injection technique is specific for mesotherapy - the technique I use for treating cellulite is Nappage. I inject manually; there is also the automatic option, utilizing a device, called Mesogun. Mesotherapy is virtually painless, adverse effects practically do not exist. So, this treatment is a quick 'lunch break' procedure, the pacient can comfortably resume her activity immediately after the mesotherapy session. The results are amazing - the cellulite disappears, the skin becomes smooth and elastic; if there are stretch marks on the treated area, they also attenuate, fine stretch marks even vanish. Balanced eating, correct hydration and physical activity are imperative for maintaining the effects of the mesotherapy. mesotherapy is a medical treatment; practicing mesotherapy implies medical knowledge and extended experience in utilizing the specific injection techniques. 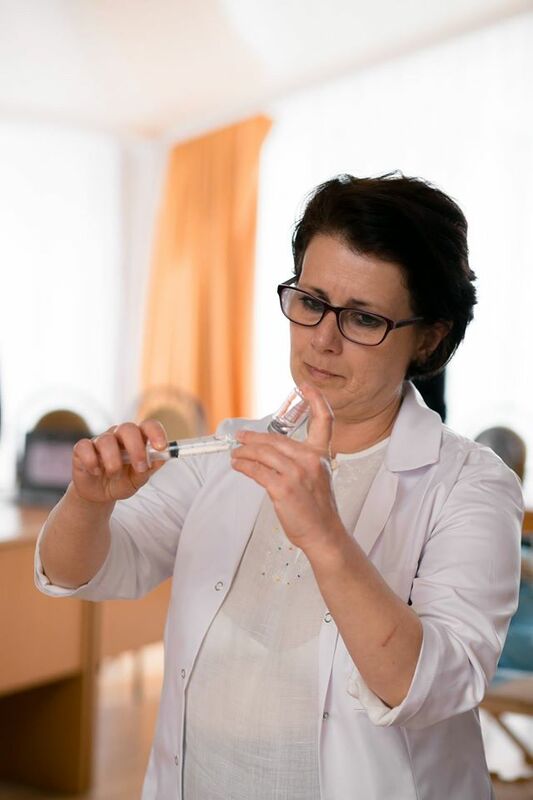 the efficiency of the treatment is not correlated with the injected amount, it is correlated with the correct choice of the active ingredients and the proper combination personalized for each and every patient.